Bite Gastrotruck is a local food truck serving up serious burgers and milkshakes to the streets of South Florida. 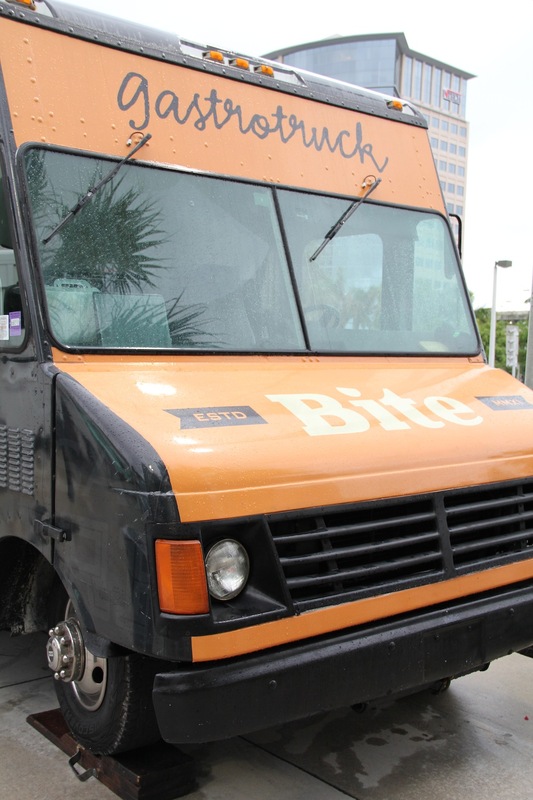 We ran into Bite Gastrotruck at a recent #TEAMAIME event in downtown West Palm Beach and gave them a try. The event featured set menus, so we had the Brisket with a carrot puree. It was super yummy and a great way to start off the event. Sadly, I planned to go back for the salmon with rice and totally forgot. My husband isn’t a huge food truck guy, but he was all over this menu, especially the BAMF with bacon-onion jam, American cheese and chipotle mayo. Personally, I was eyeing the Big Easy with aged cheddar, bacon, an over easy egg and chipotle mayo – NOM. – and the BBQ with aged cheddar, bacon, onion rings and honey BBQ. For you vegetarians out there, they have the Tree Hugger starring a grilled portobello mushroom. For sides they do Hand Cut Fries, Sweet Potato Fries and Onion Rings which you can top with sea salt and vinegar, lemon-garlic aioli, cajun spice or parmesan truffle. Their shakes menu also looked amazing with PB&J, Key Lime Pie, Krispy Kreme Doughnut and Nutella flavors making the list. I will definitely be on the look out for Bite again so I can grab one of these burgers and a shake.. and then a nap.